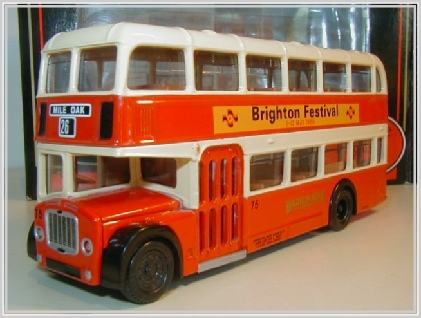 This is a picture of a model bus with the number 26 with the destination Mile Oak - manufactured by EFE. This shows that people outside have also heard of Mile Oak. This bus service operated when many of us had left the area. The date on the side advert is 1968. The 15B service commenced on the 4th February 1937 and ran from Portslade Station to the Ladies Mile Estate. On the 1st December 1945 the service was extended from Portslade Station to Mile Oak - Chrisdory Road and ran every 20 minutes. 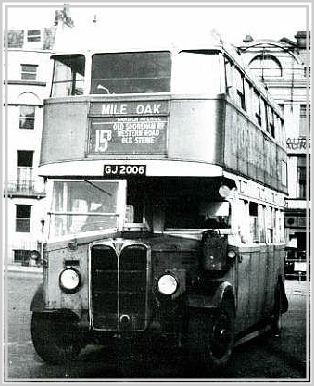 It became possible to run double decker buses to Mile Oak after the removal of the foot bridge over the High Steet in the Old Village in 1945. The bus shown was one of the last AEC Regents, these were soon replaced with Bristol buses. Poster - courtesy of Southdown Enthusiasts Club.